K51 is a single acting pneumatic rod seal specially designed not to require additional element for axial fitting within the housing. APPLICATIONPneumatic cylinders. We are specialized in offering Pneumatic Rod Seal to our customers. K56 is a two piece single acting pneumatic rod seal which consists of one nitrile rubber sealing element and one polyester elastomer scrapper profile ring. 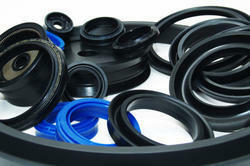 We are reckoned amongst the clients for offering a wide array of Pneumatic Rod Seals. These products are reckoned amongst the clients for their less maintenance and varied uses. The offered products can easily be fit in various items. Moreover, our products are available in various sizes and specifications. Our products are known for their corrosion resistant nature. 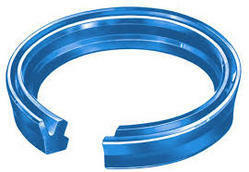 Matching up with the requirements of our clients, we are involved in offering Pneumatic Rod Seal. Pneumatic Rod Sealis ideal for pneumatic cylinders and prevents dirt and moisture to enter into the main parts of axial moving rod seals. It provides long lasting service to the rod with low deformation. It is frictionless in all kinds of pressure. O-ring activated, asymmetrical Pneumatics Rod Seal, Low friction, good dry running properties and adaptation possibilities for diverse temperatures and media by selection of suitable o-ring material, almost no dead spots as required for applications in food & pharma industry.